Your quickest way to the highest yields. 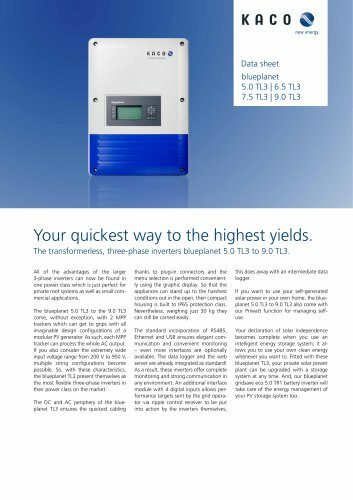 The transformerless, three-phase inverters blueplanet 5.0 TL3 to 9.0 TL3. All of the advantages of the larger 3-phase inverters can now be found in one power class which is just perfect for private roof systems as well as small commercial applications. The blueplanet 5.0 TL3 to the 9.0 TL3 come, without exception, with 2 MPP trackers which can get to grips with all imaginable design congurations of a modular PV generator. As such, each MPP tracker can process the whole AC output. If you also consider the extremely wide input voltage range from 200 V to 950 V, multiple string congurations become possible. So, with these characteristics, the blueplanet TL3 present themselves as the most exible three-phase inverters in their power class on the market. The DC and AC periphery of the blueplanet TL3 ensures the quickest cabling thanks to plug-in connectors and the menu selection is performed conveniently using the graphic display. So that the appliances can stand up to the harshest conditions out in the open, their compact housing is built to IP65 protection class. Nevertheless, weighing just 30 kg they can still be carried easily. this does away with an intermediate data logger. The standard incorporation of RS485, Ethernet and USB ensures elegant communication and convenient monitoring – even more interfaces are optionally available. The data logger and the web server are already integrated as standard! As a result, these inverters offer complete monitoring and strong communication in any environment. An additional interface module with 4 digital inputs allows performance targets sent by the grid operator via ripple control receiver to be put into action by the inverters themselves; Your declaration of solar independence becomes complete when you use an intelligent energy storage system; it allows you to use your own clean energy whenever you want to. Fitted with these blueplanet TL3, your private solar power plant can be upgraded with a storage system at any time. And, our blueplanet gridsave eco 5.0 TR1 battery inverter will take care of the energy management of your PV storage system too. If you want to use your self-generated solar power in your own home, the blueplanet 5.0 TL3 to 9.0 TL3 also come with our Priwatt function for managing selfuse.